Silver Brocade Artemisia is a compact perennial with silver colored leaves. It will grow to a height of 6" to 12" and 24" to 30" width. 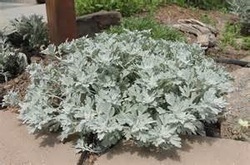 Silver Brocade Artemisia likes to be planted in full sun with afternoon shade on hot summer days. It has yellow blossoms in early summer to mid-summer. This perennial is mainly grown for its beautiful silver foliage. The foliage is very fragrant. Use Silver Brocade Artemisia in front of a perennial border, container, rock garden, moon garden, ground cover, as a specimen plant, or massed in a perennial bed. It is deer resistant and drought tolerant once it is established. Brightly colored flowers are brighter when planted next to Silver Brocade Artemisia.